Murphy bed removal isn’t a cake walk. Not that it’s all that complicated. But, it is heavy and awkward. So, it takes a lot to get it out of the house. Known for as a big space saving feature, Murphy beds are named for their creator, William Lawrence Murphy. He developed the system to hide a bed in a one-room apartment. But, to you, it’s got to go and that’s where we’ll go — Murphy bed removal. Before you drag out the tool box and begin re-arranging furniture to make way to cart that thing out, you should have a plan for what you’ll do with it. You see, the local trash collection agency won’t touch it. So, dragging it out to the curb on the street won’t help. Of course, you can dispose of it yourself, if you have the means. You’ll need a pickup truck or trailer or both. In addition, you’ll need at least one person to help you carry it out of the house. Moreover, you’ll need to tie it down while transporting it. If you do go the full DIY route, make sure you know where to take it so you aren’t running from place to place. Unfasten the hinges. Locate the hinges that connect the base to the wall. 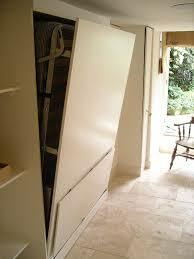 Take out the screws holding the hinges in-place carefully. (You should have someone help out for safety sake. Take off the mattress supports. Next, you can uninstall the mattress supports with a drill-driver. Exercise caution when doing this to avoid injury. These are fastened to the frame. Take them off and put the parts in a plastic bag. Remove the side panels. Follow the last step by removing the side panels. These are attached to the head and foot boards. Usually, the retaining screws are located on the inside of the frame. Disassemble the wall section. To finish, disassemble the wall section. You’ll need at least one set of helping hands to do this part for safety reasons. When you need any type of furniture removal and disposal, just phone 800-433-1094 or visit Junk Garbage Removal.